Confined bars in surrounding concrete, when subjected to tensile force, adhesive bond in addition to friction between two materials become mobilized. When both resistance are overcome, surrounding concrete is crushed eventually ahead of deformations on the bar surface and this local crushing results pullout of bars. Surrounding concrete, except that has been crushed ahead of ribs just adjacent to interface of bars, remains intact. In case of deformed bars, mechanical interlock with surrounding concrete provided by deformations is more important than adhesive force and friction. In this type of failure, concrete is split along particular length of bars. We know when a beam or any flexure member deflects, a wedging action is generated due to deformation of bars, which produce lateral tension on concrete. This failure is observed when bar spacing, concrete cover or confinement is not sufficient. 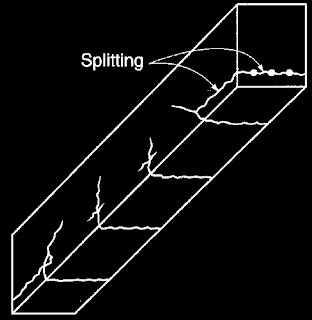 Splitting type failure of concrete beam is relatively common than bond failure due to splitting. Due to wedging action, ribs on bars bear against surrounding concrete. 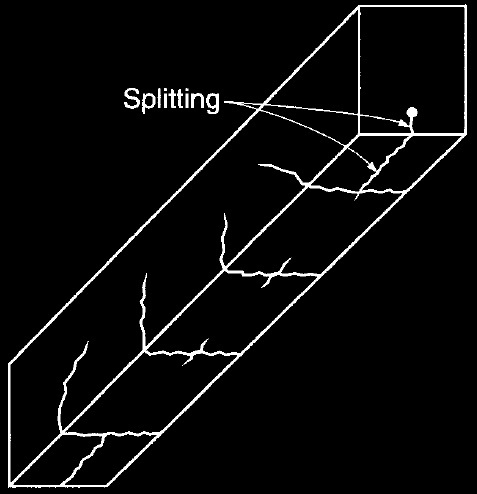 Splitting occur in two directions; as shown in Fig-1. It may generate in vertical plane or can be generated horizontally along the plane of reinforcing bars (Fig-2). 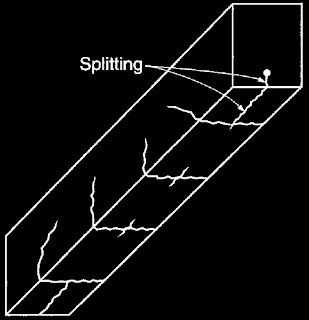 Horizontal splitting is observed frequently to start at a diagonal crack. Dowel action often increase tendency of splitting which we will discuss later. Thus shear failure (diagonal cracking) and bond failures are found interrelated but this relation is very complex to explain. Let’s discuss about dowel action; when a beam is subjected to load, induced shear force is resisted by many actions within a reinforced concrete beam. 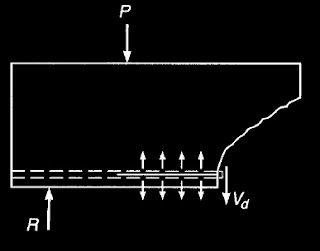 A very small amount of shear is resisted by dowel action; this is the resistance that offered by longitudinal reinforcement, as shown in Fig-3. But these reinforcing bars (acting dowel force, Vd) are supported on concrete cover below to resist vertical displacement. They exert a bearing pressure which produces a vertical tension on this concrete (Fig-3).This tensile stresses results diagonal cracks to split concrete along tension steel reinforcement. This ultimately decrease dowel force and consequently widen diagonal crack. When pullout resistance, as a combination of adhesion, friction, mechanical interlock, is overcome complete failure of bond occurs. Sliding of reinforcing bar relative to surrounding concrete result immediate failure of beam. 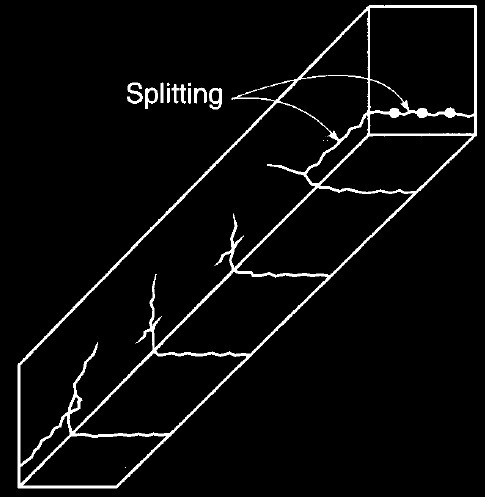 In case of splitting, complete bond failure occurs, when splitting of concrete propagates and spread up to end of bar that is not anchored. Bond forces are not uniform along the length of span of beam. This is due to presence of diagonal and flexural cracks over the length of beam. Thus we can easily realize that local failure adjacent to cracks may be happened as bond stress at particular location may be more than bond strength even under applied load far below failure load. Local failure of this type produces little local slip which results widening of the cracks and deflections is increased. This remains harmless until failure propagates throughout the entire length of bar and result is total slip. When anchorage at the end beam is reliable, and bond failure is extended to entire length but not endanger anchorages, the beam will not collapse. As end anchorage, hooks can be used; the more common option is extending longitudinal bars at a distance that is sufficient to develop bond strength of straight bars from point of desired stress. The limiting bond strength has been developed from extensive testing on beam specimens. Current design provisions are based on this testing. Present practice in beam design requires both pullout and splitting analysis of failure.